We wrote before that Rainbow Six is a game of delicate economics for the defending team. This dynamic plays out the same way for the attackers, albeit with different choices, strengths, and weaknesses. Defenders have the advantage of initiative. The attackers have to come to them to achieve victory. But attackers overall have better weaponry and more aggressive and damage inflicting gadgetry. Yet they are initially at a disadvantage with access to information. Like balancing roles on defence, attackers must also balance themselves on offence. If attention isn’t focused on the objective, defenders can hold it for longer. Defenders run down the clock, and force the attackers into risky rushes and last-ditch plays. If not enough attention is paid to deflecting roamers, then objective-focused operators lose focus, and they can’t pick off or displace anchors guarding objective rooms. Both roles need to play off each other. Defending roamers exist to harass and pressure operators who attack the objective. Attackers need to challenge defending anchors without worrying about their flanks. Use range and rifles to your benefit. While some defenders may have access to ACOG’s, their weapons are naturally at a disadvantage. Even with operators such as Rook who have an ACOG, the damage dropoff on SMGs like the MP5 are steep. Defenders have to land headshots to be effective at long range. Attacker rifles don’t suffer the same negatives. Aggressively use primary and secondary gadgets. 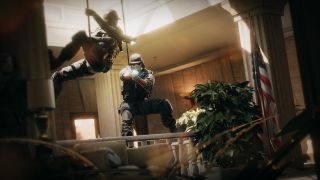 Unlike the defenders, Attackers have access to breaching-specific gadgets such as frag and flash grenades. With some exceptions, Defender gadgets are designed around delaying or confusing opponents. Attacker gadgets generally deal damage or kill. Gain information first. Never rush in blind. While the Defenders may have a natural disadvantage in loadouts, they have the advantage of initiative. Defenders can hold hallways and chokepoints without having to leave themselves vulnerable. If attackers try to engage defenders without any idea of their location or strategy, they will reduce their chances of winning firefights. Learn the maps. For attackers, knowing the maps is important to determine points where defenders typically protect and camp. Know where common spawn peek windows are. Cover them as you’re breaching. Knowledge of maps is also important to know where fixed cameras are — for a trained team, there is never a reason for any of the fixed defender cameras to be up for long. Keep up situational awareness. Sound in Rainbow Six gives away a great deal of information. Directional audio in the game reveals vital clues to where a defender is and in what direction they’re going. The reverse is also true, so minimize the amount of sound and unnecessary gunfire. And of course, get better at aiming. As with all shooter games, tactics are just one part of the recipe for victory. Aiming well, and knowing how to control weapon recoil is a vital component of winning battles. Zofia’s balanced stats and strong weaponry make her a well-balanced operator for both roamer-hunting and objective assault. Zofia was nerfed in 2018, but her dual-purpose grenade launcher still is excellent for rapid room breaching and clearing. One of the newest operators, Nomad came to Team Rainbow at the end of Year Three. Her powerful Airjab gadget makes her versatile in both attacking roles, but she is most powerful as an anti-roamer. Where Dokkaebi lacks in strong weaponry, she makes up for it with her Logic Bomb ability, which sets off defender cell phones with a very audible vibrating sound. It’s generally useless against anchors in objective rooms, but provides valuable and audible intel to attackers who don’t have any prior information on defending roamers. Jackal’s Eyenox gadget can not only detect enemy operator locations when activated, it can also passively tip the attacking team whether any activity has passed through areas of the map. In addition, both of Jackal’s primaries are powerful weapons in their own right. One an accurate, fast firing assault rifle, the other an SMG that can lay down sustained and accurate automatic fire over a long period of time. Although she can be more situational then her counterparts, IQ’s strong weapon loadout, coupled with her electronic mobile sensor can detect most of the defending operator’s gadgets through walls. Twitch’s shock drone should be used early to knock out defender gadgets and cameras. Though heavily nerfed in 2018, the shock drone still has five shots in total. Top this off with a rapid firing, high damage FAMAS as her primary, and Twitch makes for an excellent anti-roaming operator. All memes about her shifting hitbox aside, Ash’s three-speed, fearsome weaponry, and grenade launcher still make her one of the premiere rushing operators. Depending on your ability to control recoil, the R4-C is a hard-hitting, high-speed assault rifle. If you’re less confident with recoil control, the G36C is a nice and easy-to-use alternative, making Ash an all-around great attacking operator to use. The arrival of the newest American operator in Year Three changed the meta for hard breachers in Rainbow Six. Though it’s generally impractical to actually breach walls in their entirety, Maverick’s blowtorch is able to stealthily open murder holes in reinforced walls. Maverick has excellent, high-powered, and accurate weaponry with his converted AR-15 and M4 assault rifles. Listed together because they share the same role, these two operators offer differing playstyles. Thermite can blow larger, player-sized holes with one charge, while Hibana can destroy smaller holes into reinforced walls. The two operators, however, have very different playstyles. Hibana’s three-speed and high-rate-of-fire Type-89 AR gives her an experience closer to Ash. Thermite offers a bit more middle-of-the-road playstyle. A two-speed, two-armor operator, his 556xi is a bit slower firing than Hibana’s Type-89, but it is slightly more powerful and controllable. A perfect compliment to our hard breachers above. Thatcher’s EMP grenade remains a potent force, even in Year Four, disabling all electronics and destroying hard barrier reinforcements such as Bandit’s shock wires, Mute’s jammers, and Kaid’s electroclaws. Do you sense a trend? Sledge and Buck are soft breachers. While they can’t break through reinforced walls, their breaching hammer and skeleton key shotgun respectively can often break holes into key ceilings and floors to open avenues of attack into objective rooms. Rainbow Six Siege is a team-based game. Get good at your own playstyles and perfect your aim. Well coordinated teams who communicate well with each other can defeat even the best of players. When organising your attacks, strike the right balance between counter-roaming and pressure on the objective. Overload too much on either role, and defenders will capitalise on the advantage.